Has Mazda saved the internal combustion engine for the future? Most car manufacturers are gearing towards an all-electric future. Volvo, for example, recently pledged that its entire line-up will be either fully electrified or adopt hybrid powertrains in 2019. Mazda, on the other hand, believes that the age-old combustion engine still has a future, announcing the development of a new spark-less gasoline engine that will be cleaner than electric cars. The revolutionary technology will power a range of cars in 2019, starting with the next-generation Mazda3. The next-generation of Mazda’s highly efficient Skyactiv technology, known as Skyactiv-X, will form part of Mazda’s long-term “Sustainable Zoom-Zoom 2030” strategy. Mazda’s goal until 2030 is to reduce its corporate average level of CO2 by 50 percent compared to 2010, and reduce it even further by 90 percent by 2050. 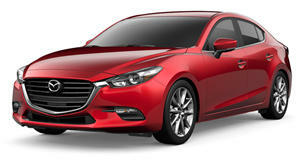 As part of this strategy, Mazda will “continue efforts to perfect the internal combustion engine,” as it believes it will continue to power the majority of cars worldwide “for many years to come.” Skyactiv-X will be the world’s first production gas engine that uses compression to ignite the air-fuel mixture instead of spark plugs. Essentially, Skyactiv-X combines the advantages of gasoline and diesel engines. Just like in diesel engines, Skyactiv-X engines will use fuel-air mixture that ignites “spontaneously when compressed by the piston”. Spark plugs will still be used for operation during low temperature, however. The compression ignition allows for a super lean burn that will improve engine efficiency by 20 to 30 percent over the current Skyactiv technology and between 35 and 45 percent over Mazda's 2008 gasoline engine of the same displacement. The new Skyactiv-X will also be supercharged to deliver 10-30 percent more torque over the manufacturer’s current gasoline engines. Furthermore, Mazda claims that the next-gen gasoline engine will match or even exceed the fuel efficiency of the latest Skyactiv-D diesel engine. Don’t think, however, that Mazda won’t be introducing any EVs or hybrids in the future. Once the Skyactiv-X technology has been introduced, Mazda will launch its first wave of electric cars in 2019 “in regions that use a high ratio of clean energy for power generation or restrict certain vehicles to reduce air pollution.” A year later, Mazda will begin testing its autonomous technologies that are currently in development, with the aim to have every model fitted with the technology as standard in 2025.